Despite our position in the middle of the icy North Sea, the southern part of Britain has long been noticeably warmer than the north, but during the Little Ice Age even the south was distinctly chilly. During particularly cold winters, even the Thames would freeze. This certainly happened on a number of occasions during the Little Ice Age period, but the first recorded incidence of the river icing over actually dates back all the way to 250 AD, when it is said to have been frozen solid for more than two months. It froze again in 923 AD, when the ice was so thick that carts used it as a roadway for three months, but by the 14th century, these freezes were slowly becoming more frequent and more severe. And by the 16th century the frozen Thames was seen safe enough to receive royal favour – Henry VIII, always an adventurous man, is said to have taken a sleigh journey to his palace at Greenwich along the river ice in 1536, and his daughter Elizabeth I is known to have taken walks on the frozen river in 1564. As time went on, the freezing process was helped by the fact that, prior to a mad outbreak of Victorian bridge building and embankment creation during the 19th century, the Thames was much wider and shallower, and ran much slower than it does now. The many narrow arches of the 12th century London Bridge made the river even more likely to freeze, as they rapidly became blocked by ice which then acted as a dam and encouraged even more ice to form. The frozen river must have been quite a sight to see on a cold winter’s day in London, particularly in later centuries when the city was rapidly developing and expanding, and the Thames was usually in constant use as a thoroughfare and trade route to and from the port of London and the docks. In these times before employment protection laws and Jobseeker’s Allowance, the temperature dropping just a few degrees more below zero could be a matter of life and death on many levels and for far too many people. 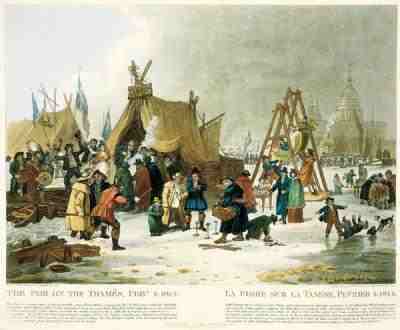 The Little Ice Age must have made life very difficult for ordinary people generally, and for the very poor in particular, but, paradoxically, it could also mean fun and entertainment on the ice itself in the shape of the always-popular Frost Fairs. The first official Frost Fair was in 1608, but, as we have seen, the frozen river had been used informally for fun and games for far longer than that – there are even records of icy football matches and archery contests on the Thames in the 1560s. Between 1400 and 1815, the Thames seems to have frozen over on at least 24 occasions. Out on the ice, there was something for everyone; fairground rides, stalls selling hot food, drink and souvenirs (then as now, there was a lot of money to be made from such retail opportunities! ), rowdy games of hockey, football and skittles, the sound of musicians and singers, the sights and smells of a roasting ox or sheep – and even horse races. It’s easy to see how exciting this would have been to so many ordinary Londoners, longing to escape (albeit only for a few hours) from the freezing cold, dirty, poverty-stricken city. The last Frost Fair was held during the winter of 1814, and amongst the excitements to be found out on the ice was the astounding sight of an elephant being led across the river, not far from Blackfriars Bridge! Other highlights included donkey rides across the frozen Thames, printing presses churning out the 19th century equivalent of souvenir tour programmes and club flyers, booksellers, toysellers, spit-roasted mutton, and lots and lots of booze (of course). But all this frosty merriment was too good to last, and within less than a week the ice had begun to melt. The Frost Fair melted away with it, never to be seen again. Less than twenty years later, in 1831, the old London Bridge was demolished to make way for a new structure with fewer, wider arches, improving the flow of the Thames in the process. The design of this new bridge, along with the gradually achieved embankment project and a slow warming of the climate, ensured that the river would never again freeze like it did in 1683 and 1814.